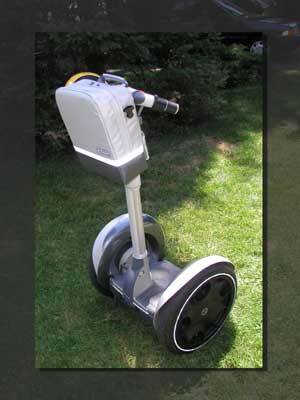 Segway™ Human Transporter (HT) can self-balance because of a technology called dynamic stabilization. Dynamic Stabilization works in much the same way your own sense of balance does. Where you have an inner ear, eyes, muscles, and a brain to keep you balanced, the Segway HT has solid-state gyroscopes, tilt sensors, high-speed microprocessors, and powerful electric motors performing to keep it balanced. Working in concert, these extensively tested, redundant systems sense your center of gravity, instantaneously assess the information, and make minute adjustments one hundred times a second. Segway HT balances whether you're traveling at 10 mph, carrying a heavy load, slowly maneuvering in tight spaces, or standing perfectly still. The Segway HT intuitively balances the way humans do—moving forward and backward, responding to changes in your body's position. There is no accelerator and no brakes. Lean forward and you move forward. Straighten up and you stop. Lean back, and you move back. To turn, rotate the steering grip under your wrist in either direction. Operation is natural, intuitive, and one of the primary reasons Segway HT so seamlessly integrates into enterprise situations, pedestrian environments, and everyday life. 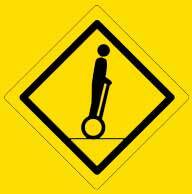 This Segway Description was taken from www.segway.com. © 2003-2011 Mobile Entertainment, LLC. All rights reserved.